Eerily beautiful aerial footage has captured a shark feeding frenzy close to a beach in the Australian state of New South Wales, prompting authorities to close the waters to swimmers. 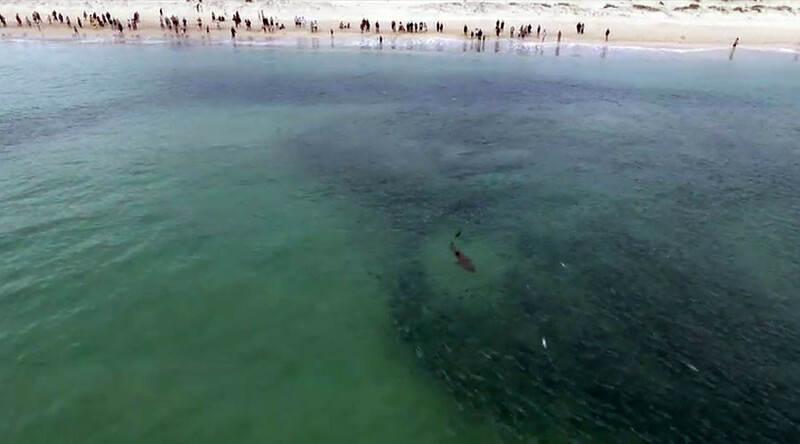 The drone footage shows grey nurse sharks hunting a school of mullet fish at Fingal Bay in Port Stephens, a small township on the continent’s southeast coast. The sharks can be seen corralling the shoal of fish together in a feeding frenzy, while many fascinated spectators watch on from the nearby beach. Local media have previously reported on shark sightings in the area. The footage was uploaded to YouTube by Damian Hurley on Saturday and has so far been viewed over 285,000 times. As of early Monday, the beach remains closed, with five sharks spotted in the waters – no doubt drawn by the plentiful fish.